This is the perfect boat for a Mentawais surf charter- fast, stable, safe, roomy, and super comfortable . 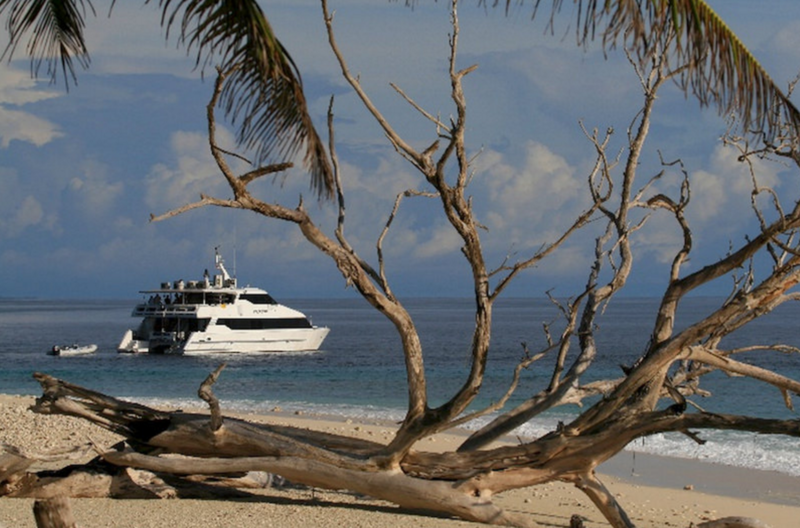 Captained by owner/operator Eric Foraker and an experienced crew, MV Addiction will get you to the best breaks from the Mentawai islands to North or South Sumatra, from world renowned waves to remote and rarely surfed perfection. See the Mentawais Surf page for more information. At 24 metres long and 8 metres across the beam, Addiction is one of the largest cruising boats in the Mentawais. Three guest cabins have a double bed and single bunk and a fourth cabin has four bunks.. The large gourmet galley has dinner seating for 12 and the expansive saloon/lounge area features plasma screen and entertainment systems. Two large outdoor deck areas to sun bake, watch the surf or and enjoy a drink or dinner as the sun goes down. Tony the chef is experienced in all types of western food and Asian-fusion type cuisine. Addiction is a commercially constructed catamaran with all of the safety features. And nothing offers comfort like a large catamaran, whether sitting at anchor or flying along at over 20 knots, Addiction will be the smoothest ride you’ll ever have. Two MTU V8 engines, 965 Hp each, give a top speed of 26 knots while the four 2500 l fuel tanks enable extended trips into remote surf areas. Atoll Travel clients are met personally at Padang Airport at the start of their holiday, and a private van takes them directly to the boat. Holiday trips are from 12 to 16 nights, with 11 to 15 days of surfing. Most holiday trips are booked on a full group basis only. Groups can discuss their surfing preferences with the skipper, who will plan an itinerary that matches their wishes to the prevailing conditions. At the end of the trip, clients are transferred directly from the boat to the airport, or to on-shore accommodation if they want to do more traveling or sightseeing in the area. Atoll Travel holiday packages include airfares via Singapore with Singapore Airlines/Garuda or via Kuala Lumpur with Malaysian Airlines to Padang, all transfers, surf guide, three gourmet meals per day, snacks, fruit, bottled water, hot drinks, juices, sodas.soft drinks, and use of all MV Addiction onboard equipment and amenities. Extra charges apply for onboard beers, sat-phone, souvenirs, ding repair, video and photo service, etc, so bring some spare cash.